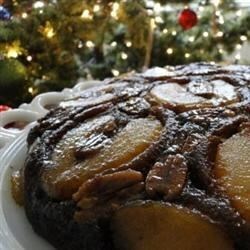 "Gingerbread and pears are combined in a beautiful and tasty upside down cake that is a delightful blend of fruit and spice." Preheat oven to 350 degrees F (175 degrees C). Mix the melted butter, corn syrup, and brown sugar in a 9-inch round cake pan. Slice pear halves in half lengthwise. Place a pecan in the center of each pear quarter. Place pears cut side down in the cake pan, arranging them like spokes radiating from the center of the pan. Sprinkle any remaining pecans around the pears. Prepare the cake mix according to package directions, and pour over the pears and pecans in the cake pan. Bake 40 minutes in the preheated oven, or until a knife inserted in the center comes out clean. Cool slightly before turning out onto a serving dish. Mallinda, this was great! That caramel was genius! My family loved it. Thanks!